Sir Robin Philipson (1916-1992). A seminal figure in the history of twentieth century Scottish painting, Philipson's influence was tangible on his peers and students alike, both through the dissemination of his very individual style and the encouragement he gave his many pupils. Philipson studied at Edinburgh College of Art from 1936 to 1940 and joined the staff in 1947. During the Second World War, he served in India and Burma with the King's Own Scottish Borderers. His early subjects were mainly landscapes, still lifes and interiors showed a debt to Kokoshka whose work Philipson had studied in depth. He was also close to William Gillies and John Maxwell who were co-members of the group known as the Edinburgh School which included Anne Redpath and William MacTaggart. 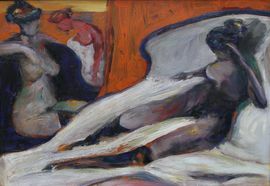 In the 1950's Philipson was influenced by American Abstract Expressionism. It was at this time that he worked on his famous cockfighting series. He had his first solo show at Aitken Dott & Son (The Scottish Gallery) in 1954. Like many Scottish artists of his generation, Philipson was well-known for his bold colours, heavy impasto and his free use of paint, yet he always retained a precise figurative element within his work. In 1960 Philipson visited Amiens Cathedral in Northern France. Gothic architecture combined with stained-glass windows provided the source for a number of paintings of church interiors and crucifixions during this period. Philipson was a hugely popular figure within the Scottish and English art worlds and was elected an Honorary Royal Academician. His work has featured in several important and influential shows including 'Seven Scottish Painters' at the IBM gallery in New York. He was knighted for his services to the arts in Scotland. Philipson was President of the Royal Scottish Academy from 1973 to 1983.